Anti-Semitism and anti-Zionism: Does an ADL survey show hatred of Jews or anger at Israel? 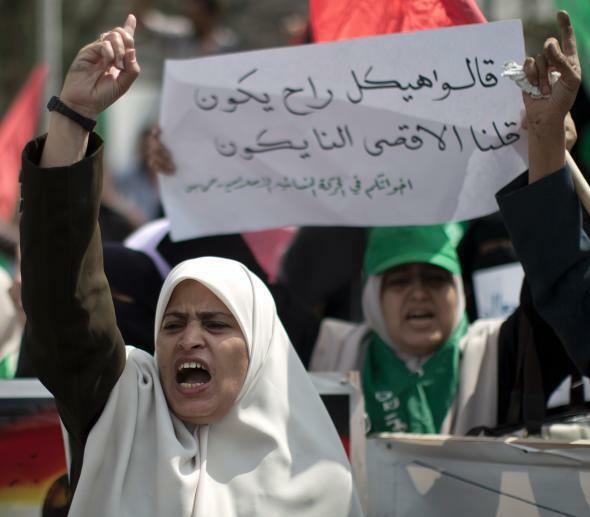 A Hamas-organized protest in Gaza against Israeli control of the al-Aqsa mosque, Sept. 24, 2013. The Anti-Defamation League has released a worldwide survey of anti-Semitism. It’s an excellent resource, creating an index that can measure increases or decreases in prejudice against Jews. The most striking finding is a vastly higher rate of anti-Semitism in the Middle East and North Africa (MENA) than in the rest of the world. But much of this difference seems to be more about Israel than about Jews. The survey offered respondents 11 statements expressing suspicion or resentment of Jews. In North and South America, 19 percent of respondents said that at least six of these statements were probably true. In Western Europe, the number was 24 percent. In Eastern Europe, it was 34 percent. In MENA, it was 74 percent, twice as high as any other region. The 15 most anti-Semitic countries were all in MENA. Why such an enormous gap? One explanation might be exposure to anti-Jewish propaganda. But in that case, you’d think higher education would help. In most of the world, it does. In the Americas and Western Europe, people who had more years of schooling (finishing at age 23 or older, as opposed to finishing at age 18 or younger) were less likely to express anti-Semitic views. In MENA, however, they were more likely to express such views, by 10 percentage points. Another explanation could be social inexperience. Seventy-eight percent of respondents in MENA said they had never met a Jewish person, compared with 73 percent of respondents in other regions. But that’s not a big difference. And one of the survey’s most surprising findings was that in the entire sample, people who said they had never met a Jew were no more likely to affirm the anti-Semitic statements. Why would region overpower religion? The obvious guess is proximity to Israel. The most anti-Semitic places on the planet, according to the survey, are Gaza and the West Bank, where 93 percent of respondents affirmed at least six of the anti-Jewish statements. One way to quantify the Israel factor is to look at the survey’s findings on favorability (see the table below). Outside MENA, if you compare the “unfavorable” ratings of various religions, Jews score worse than every group except Muslims. Inside MENA, Jews score at the bottom. Even so, Israel scores lower than Jews. In MENA, the percentage of respondents who express an unfavorable opinion of Israel is 17 points higher than the percentage who express an unfavorable opinion of Jews. That’s twice as big as the unfavorability gap between Jews and Israel outside MENA. If you look at net favorability (the percentage of respondents who express a favorable opinion, minus the percentage who express an unfavorable opinion), you’ll see the same pattern. Outside MENA, Jews outscore Israel in net favorability by 10 percentage points. Inside MENA, they outscore Israel by 25 points. Other findings in the survey (see the next table) underscore the Israel effect. One question asked respondents whether violence against Jews in their country was driven by anti-Jewish or anti-Israel feelings. Outside MENA, responses were evenly divided. In MENA, however, it was no contest: 69 percent cited anti-Israel sentiment, while only 10 percent cited anti-Jewish sentiment. Outside MENA, 13 percent of respondents said Israel’s actions had a major influence on their opinions about Jews. Inside MENA, the number was 46 percent. Outside MENA, the net effect of Israeli actions on opinions about Israel was negative by 26 percentage points. Inside MENA, it was negative by 84 points. These findings don’t mitigate the gravity of the overall results. The number of people worldwide who explicitly affirmed most of the anti-Jewish statements (26 percent) is worrisome. The number in MENA, 74 percent, is alarming. But a lot of that gap seems to be driven by anger about Israel, not by classical anti-Semitism. If Israel’s situation can be resolved, it’s possible that much of the hostility to Jews will subside.